both/and -a rabbit? a duck…? a series of lines / shading forming a differential between figure and ground? I cherrish time the kids and I spend staring up at the clouds lying in the warm grass where we are free to do what comes natural. When we choose to make the time to do this, it’s amazing how natural it seems to us “seeing as”. The projection our perceptions upon an observable world, as you can imagine – rarely do we exclaim: “look at the density of that vapor!” It just doesn’t happen that way. 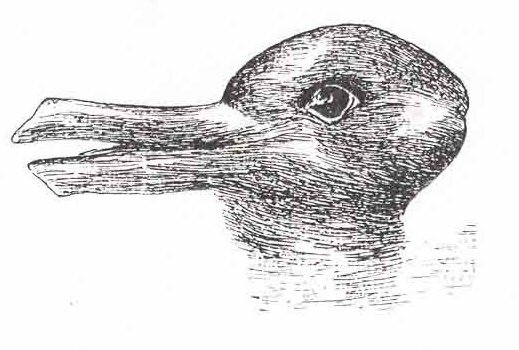 This entry was posted in Inspiration and tagged both/and, duck-rabbit, figure, ground, illusion, image, perception, Wittgenstein by Matt Niebuhr - West Branch Studio. Bookmark the permalink.